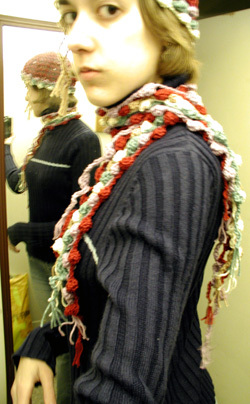 This pattern comes from the Woman’s Day Specials: Quick & Easy Knitting & Crocheting premiere issue. 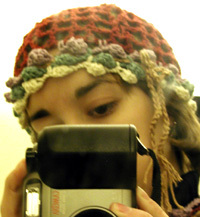 It’s my first crochet project. The stitches I learned are ch, sl st, sc, dc, and a special “popcorn” stitch (pc). The yarn is TLC Cotton Plus 51% cotton / 49% acrylic in the colors Red (3907), Lavendar (3590), Spruce (3503), Cream (3100), and Tan (3303). I used a size H-8 hook. This scarf is so amazing! I’ve never seen anything like it, and I’m having trouble figuring it out from the picture. Do you have a pattern? Thanks for sharing it’s beautiful! 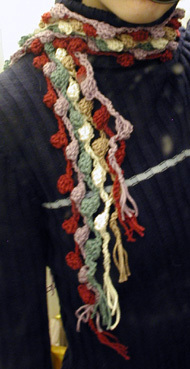 Hi Charli, I used a pattern in an old magazine but I believe it’s just popcorn stitch with chain in between.